Robert Bly at the American Swedish Institute, launching "Airmail." Star Tribune photo by Jerry Holt. 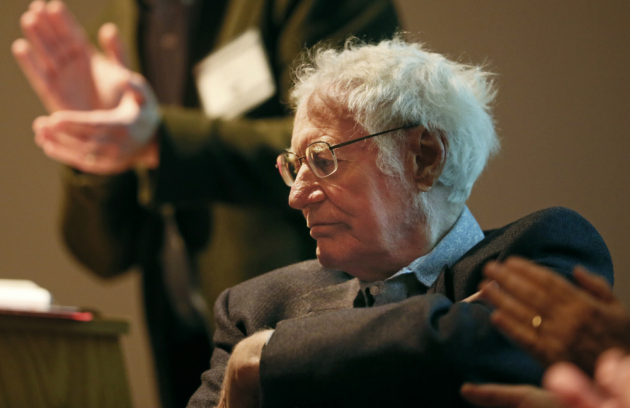 It was only at the very end of the evening, when Robert Bly read a poem by his longtime friend Tomas Tranströmer, that he grew animated, his voice dipping and swaying, gaining in power. He crisply enunciated the words, added that famous little Bly twist, and looked straight out at the crowd. Up until then, he had been a bit subdued, reading aloud softly from his new book, "Airmail: The Letters of Robert Bly and Tomas Tranströmer," not looking up. He launched the book Tuesday evening at the American Swedish Institute in Minneapolis, reading aloud some of the letters he had written to Tranströmer in the 1960s and 70s and 80s. Roland Thorstensson of Gustavus Adolphus College read the Tranströmer replies. The room was packed, 300 people there to listen to three dignified and serious men on stage--Bly, Thorstensson, and poet Thomas R. Smith, who spent ten years editing the collection, which was published this month by Minneapolis’ Graywolf Press. Jeff Shotts, Graywolf Press’s executive editor, called Smith a “tireless, passionate poet and editor,” noting that in the course of his research Smith had discovered among the letters a Tranströmer poem that had never been published. “I can’t tell you what a remarkable moment that was,” Shotts said. 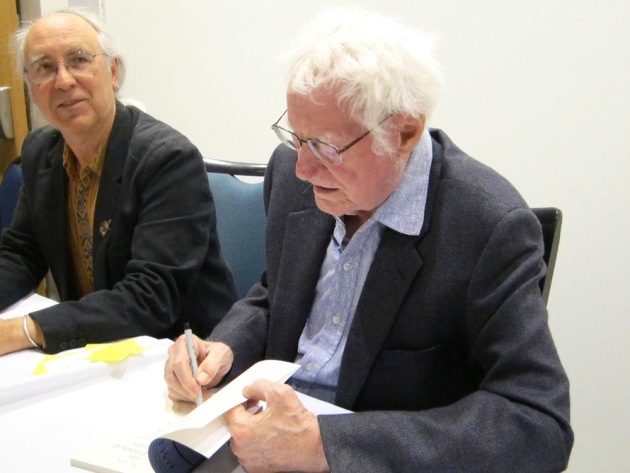 Thomas R. Smith and Robert Bly sign books after Tuesday's reading. Later in the evening Bly and Thorstensson read that poem, “Conflict,” Bly reading it in English, Thorstensson in Swedish. But the night really belonged to Bly, 86, a man whose “contributions to global literature cannot be exaggerated,” Shotts said. His famous mane of white hair is shorter, and he was a little shaky mounting the steps to the stage, but his voice remains sweet and nasal and—especially when he read poetry—strong and true. At the end of the evening, Shotts read one last letter—a note written Monday by Tranströmer and sent, this time, by e-mail rather than airmail. He ended with a postscript, congratulating Bly on receiving the Robert Frost Medal, the highest award from the Poetry Society of America. Bly and his wife, Ruth, will travel to New York later this week for the ceremony. And as Bly sat quietly in his chair on the stage, the 300 people in the room rose to their feet, and applauded.